Chavittu Natakam, a colourful and vigorous theatre form, is considered to be a folk art form noted for its attractive make-up of characters, their elaborate costumes, detailed gesture, and well-defined body movements. It is believed that the art form flourished at Kodungalloor in Kerala with the spread of Christianity. The Portuguese are supposed to have introduced this art form in Kerala. Chinna Thampi Pilla and Vedanayakan Pilla are considered to be the originators of this art form. The influence of the western visual art opera can be discerned in Chavittu Natakam. Art forms like Kathakali and Kalaripayattu have also influenced Chavittu Natakam. The most attractive feature of Chavittu Natakam is the artistes stamping the floor producing resonating sounds to while dancing hence it is also called Stamping Drama. This folk-drama dance takes place on a stage that is referred to as ‘thattu’. The ‘thattu’ is laid with planks of wood. The exquisite costumes of the artistes portray the characters on stage. Generally, the costumes resemble ancient Greek-Roman soldiers and European kings. Instruments like Chenda, Padathamber, Maddalam and Ilathalam, provides background music. These days Tabala, Fiddle, Flute and Bulbul are also played. The Chavittunatakam performance opens with an invocation and the opening sequence is in the form of a Virutham. 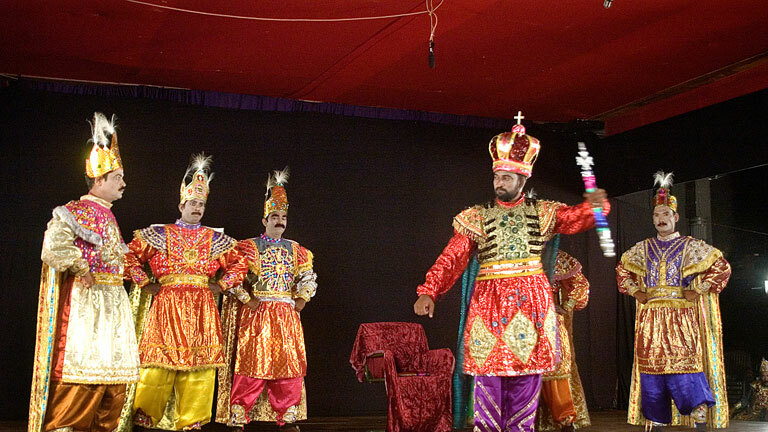 It is a humming which is followed by a scene of a durbar and the play begins. The Kattiyakaran – Vidooshakan enters the scene introducing the characters humourously and even tries to imitate them. The dialogues are in the form of a song. The actors sing their lines loudly, and with exaggerated gestures stamp the wooden stage with great force. The stamping (Chavittu) tells us the quality of the character. Thus, the stamping for good and bad characters are different. Women characters stamps the floor lightly. Some of the most popular plays in Chavittu Natakam are Carelman Charitham (Charlemagne the Great), Brijeena Charitham (Life of Queen Brijeena), Marthoma Sandesam (Message of St. Thomas), St. Sebastian, Daveedhum Goliyathum (David and Goliath), Mahanaya Alexander (Alexander the Great) and Veerayodhakkalude Anthyam (Death of Great warriors).